One of the sources which James Koehler drew on in the colour workshop was the picture you can see here — I am not sure what book it comes from, but someone has already kindly uploaded it to flickr with a wee bit of commentary. As I understand it, the characterisations of the colour groups as “lucid”, “reflective” and so on are due to Goethe, and I found them rather intriguing. I would never have thought of yellow, orange and green as “serene” for example, unless the mix was about 90% green and 10% yellow/orange, so I wonder what Goethe had in mind? Anyway, the way these colours are made is also interesting, and I have tried to illustrate it using Excel (so apologies if the colours are a bit garish). 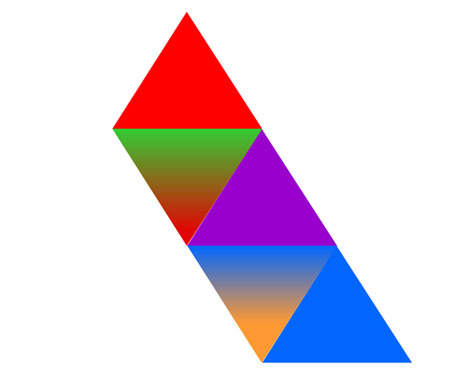 The triangle starts with the primaries (red, yellow and blue – we are talking pigment rather than light here) at the corners and the secondaries (orange, violet and green) in between. But what happens in those little white spaces? Well, I am going to concentrate on the right-hand side of the triangle, the red-violet-blue, so first of all I am going to drop the yellow vertex as we won’t be needing it. Then I am going to start mixing. The space adjacent to the red will be filled with a mix of red and its complementary colour, green. Similarly, the space adjacent to the blue will be filled with a mix of blue and orange. If I were doing this with paints I’m sure we would now be looking at shades of brown (presumably Goethe & Albers didn’t have this problem). And recent versions of Excel seem to have given up allowing one to fill the interior of shapes with stripes, which is a little annoying. So what I have chosen to illustrate the result are these rather alarming “gradient filled” triangles. I think they convey the general idea — somewhere in the middle is the colour you end up with — but for my purposes, actually holding onto the separate primaries and secondaries in the mix is quite useful. We did some wrappings this way at the workshop, and it was amazing how the same selection of six colours became all sorts of combinations in the hands of different students. 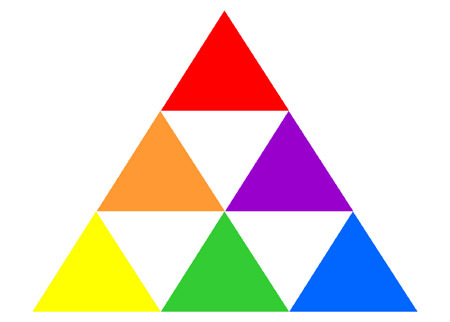 The five triangles shown above make the colour group which Goethe described as “serious”. They include my favourite purples, so it is a group which rather appeals to me; and I thought I would explore the idea with a small range of “Serious Scarves”. Here are the reds, violets and blues I chose, laid out along the right hand side of a triangle you will only be able to see if you are of royal blood. but I think that throwing in those complementary colours gives the red-violet-blue combination quite a lift. Plus I am planning to use some very frivolous drafts, which I’m still working on. I love your method of deriving the color sequences! 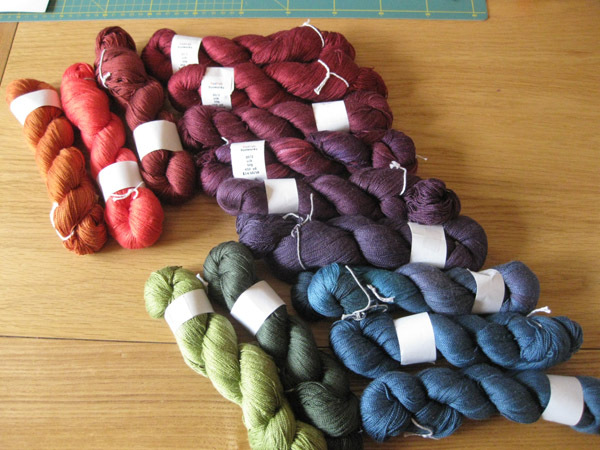 And I agree completely about the Red Fish yarns – colors to drool over, and of course the fact that it’s silk… Can’t wait to see the woven scarves. Thank you so much, Cally, for continuing to post this series. It’s not only lovely looking at your colors, but a wonderful learning how to work with colors – something I’ve been doing for my mentor this month. I knew I worked with colors in a rather 2-denominational way, but I didn’t know how to get out of it. So thank you very much. I was just wondering if you could possibly put a keyword/tag to this series of Koehler/color posts – makes it easy for me to follow and, ahem, put up links to??? Thanks. Sorry, never mind, I can follow with your “color” tag. Oh, what a great workshop that must have been! Your colors are lovely; I’m looking forward to seeing your progress! I’d just hang the wrapping on the wall and be done. That is a small piece of art sufficient unto itself. Except you do have all that beautiful yarn…………. As usual you shame me! While I bemoan spending €7.50 to see a pile of steaming poo, you’re quoting Goethe, making beautiful wrappings, Annie Albers Bauhaus style investigating and offering an all round very lush blog post. 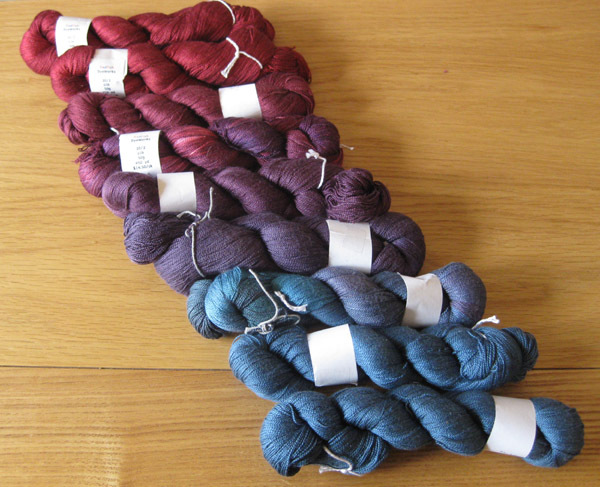 The silk looks gorgeous, the kind you just want to scrunch in your fingers. The only person I know who might have 3 kaftans is Margo, from the Goodlife – whatda reckon? seriuos warping indeed, great method for color sequencing. now i have an excuse to get my face to excel and learn how to use it. ughhh, mortified by the typo. i meant serious. Thanks for all the nice comments, guys. I’m enjoying my colour play! Meg, you should read this post from Dot’s blog a couple of years ago. She has all the books I am coveting at the moment. I need to save up, though, after the Big Trip. Ruth, I think you’re right. We had better buddy up with Margo. Didn’t she have an ornamental spinning wheel too? Hi, I’ve just found your website, you’ve got some beautiful stuff, I particularly love these scarves, such gorgeous colours.